Above: Standing at the city line, Charly Carter, of Maryland Working Families, calls for elected leaders to pressure Verizon to bring FIOS to Baltimore. 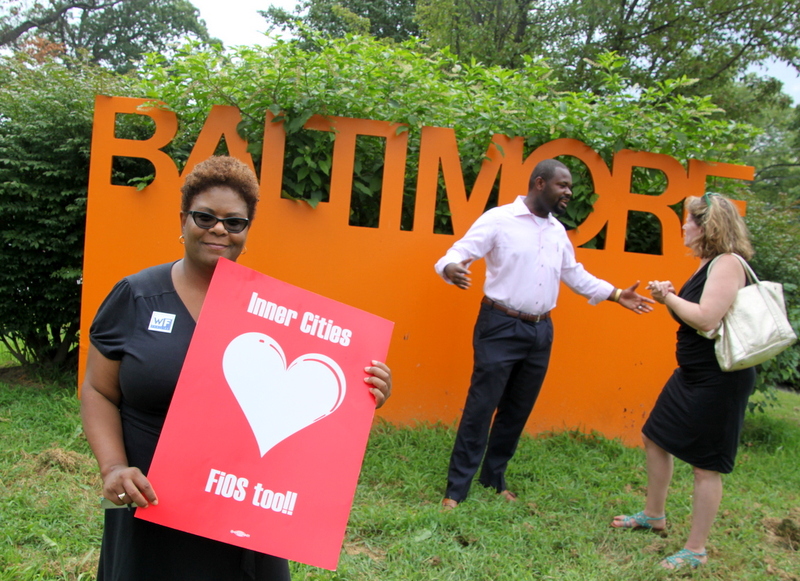 Saying that a mayoral task force report on broadband doesn’t go far enough, activists stood at the Baltimore City line yesterday and called on city leaders to pressure Verizon to invest in high-speed Internet that suburban residents take for granted but city neighborhoods critically lack. A recently-released draft report of the Smarter Cities Task Force makes recommendations for creating a broadband network in Baltimore, but the activists said it fails to point out the fastest way to get Baltimore connected is to get Verizon to build the needed infrastructure. “The report says the city is going to do its own network. That it’s going to wire city government and libraries and try to wire new schools. Is this really going to happen? In this city they tell us has no money? People sitting in these communities can’t wait for this,” said Charly Carter, executive director of Maryland Working Families. Carter noted that four years ago, in February 2010, Verizon announced it was not going to be bringing FiOS to the city. That decision prompted charges of redlining and sparked an aggressive campaign by the tech community and by neighborhood, civil rights and faith leaders to persuade the company to wire the city as it had neighboring counties. 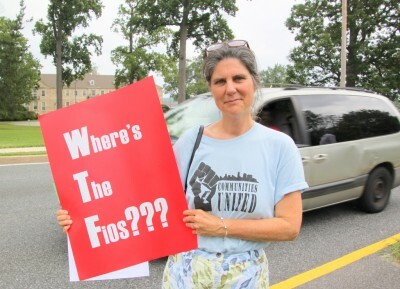 In 2012, the coalition asked Mayor Stephanie Rawlings-Blake to join them in pushing the FiOS issue with the Federal Communications Commission when Verizon needed the agency’s approval of a marketing agreement with cable companies. “Three years ago we came to her and said, ‘Let’s try and get something for the city from the FCC before they give them this thing they want,’” Carter said, noting that the mayors of Boston, Buffalo and Philadelphia agreed to join them. The mayor’s communications office has not returned a request for a response from The Brew. Among the demonstrators were members of Maryland Working Families and labor and faith leaders, as well as one state elected leader (45th District Del. Cory McCray) and one City Council candidate (Zeke Cohen for the 1st District). The demonstrators said the Task Force report includes some good recommendations. Both the 27-page Smarter City draft and a separate report commissioned by the city from Magellan Advisors call building a digital infrastructure essential to make Baltimore an attractive city for residents and businesses, as well as economically competitive locally, nationally and internationally. The Task Force calls for mapping all existing public, private and institutional fiber optics in Baltimore to identify gaps, leveraging public private investments (including schools, libraries and recreation centers) to improve community access to digital resources, and providing “technology-driven” city services that reduce costs and increase transparency and accountability. It also calls for the the creation of a broadband agency. The Magellan report recommends a $16 million project to bring high-speed internet to all city schools and a “dark fiber” leasing program so broadband providers can lease access to the fast internet service from the city. But the activists said that pressing Verizon to bring FiOS to all city neighborhoods would be an acknowledgment of the urgency of the issue. In 2010, the company said their decision had nothing to do with race or income level. “Verizon does not redline. We never have and never will,” spokeswoman Sandra Arnette told The Brew in 2010. “It’s illegal, immoral and counter to our century-old legacy of providing good service to Baltimore residents,” she added. Yesterday’s demonstrators argued that the situation is a de-facto result of discrimination, with high-speed Internet widely available in the affluent counties and, with a few exceptions, not obtainable in a poor, majority-black city. “It’s an issue of equity. 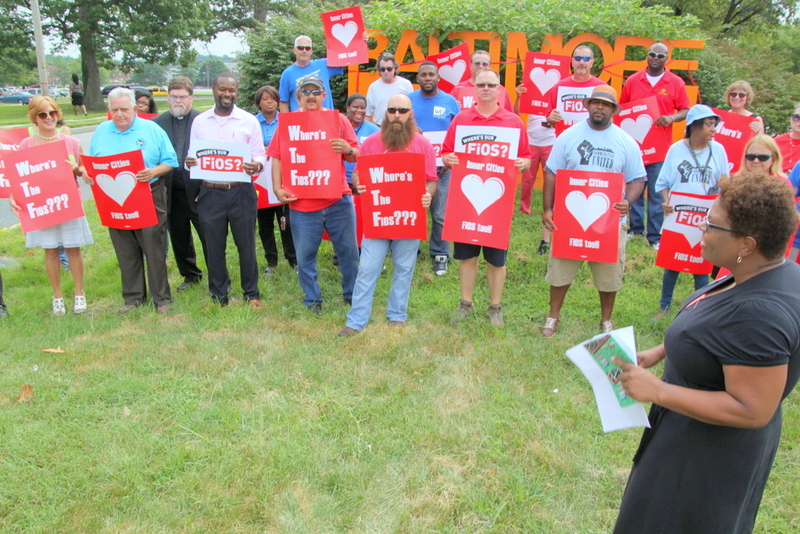 It’s about making 21st century broadband available to kids, to working people, to ex-offenders trying to find jobs,” said Jane Henderson, of Communities United, standing on Route 40 and pointing to Baltimore County. Here’s a comment sent in by Harry J. Mitchell, Director-Media/Public Relations, Verizon Communications. “Where’s My FiOS? is a campaign orchestrated by leadership of the Communications Workers of America and its special interest supporters to try to gain an advantage in negotiations for new labor contracts, which expire at midnight Saturday, August 1. The timing of this event, less than four days away from the contract deadline, is evidence enough. These types of antics do nothing more than divert attention from the real issues that have to be resolved at the negotiating table. Verizon has presented CWA leaders with a solid proposal, and we hope all parties can work together to reach agreement on a new contract that continues to provide solid, upper-middle-class jobs for our employees, exceptional services for our customers, and flexibility that Verizon needs to succeed in the marketplace. More information on bargaining is available at www.verizon.com/bargainingfacts. As we have noted since 2010, Verizon’s focus is on completing our remaining fiber network build commitments under existing video franchises, and increasing sales to the homes and businesses in areas where our all-fiber network is available. We are not looking to pursue new video franchises or expand our fiber network to new markets.